Me and Joyce were planning to do a buddy read but we cannot really decide on what book and as a good sign, B came home with The Maze Runner. It turned out that Joyce also has a copy so we’ve decided to read this book. Thomas wakes up inside a box with no memory of his life except of his name. He finds himself in a strange place called the Glade where group of teenage boys called Gladers are living for the past two years. 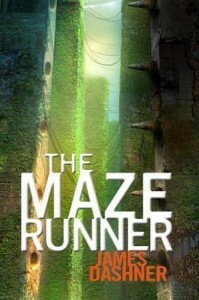 Surrounded by monstrous stone walls which is the Maze and vicious Grievers, the Gladers spend their time trying to solve and find a way out. Thomas’ arrival brings weird things in the Glade including the arrival of a girl. Though this book is more focus on the plot development than the characters, I still enjoyed reading it. I adore the friendship among the boys and how organized they were in the Glade. The secondary characters are more appealing to me and my favorite was Chuck. For me he was the most bravest and he made me cry. My least favorite was Teresa. I was expecting that because she is the only female character in this book, she will probably make something different. Maybe she did but it didn’t work for me. Hopefully I’ll get to like her on the next book. I was lost in the beginning of the book and like Thomas, I was also frustrated because nobody wants to answer his questions. It took awhile, half of the book i think, before the questions were answered and this can probably cause a negative effects to the readers. I personally felt a little impatient about it but it didn’t really make a huge effect on me. I just keep on thinking that it may have something to do with the sequel or the trilogy itself. These unique words called the Gladers slang quite annoyed me at first but then I thought that it was accurate because the Gladers really don’t have any idea how it is outside the Maze including how people communicates with each other. We cannot deny that the author’s way of describing things are exceptional. The Grievers were scary and totally dangerous but I had a hard time visualising them. I know it may sound funny but I cannot help not to think of a champion from League of Legends named Rammus. The Epilogue. It’s obvious that everything is still not okay because it is a trilogy but I still don’t know what to expect. The twist is perfect and unexpected. This book entertained me and I will definitely start reading The Scorch Trial right after posting this review.